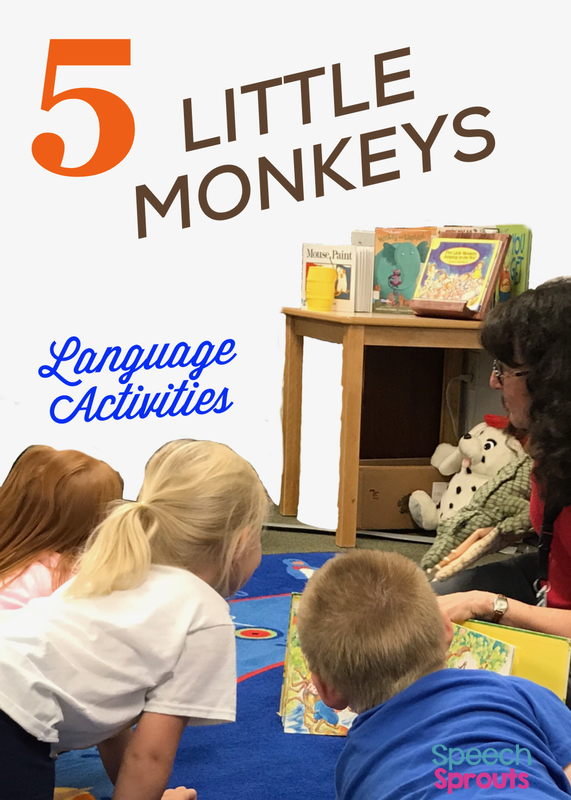 We just finished up our Five Little Monkeys week with my preschoolers. So much speech and language covered and oodles of enthusiasm! I pulled out this unit for my Pre-K program, but my Kinders saw some of the activities and begged to do them. (I have never met a child who doesn't love monkeys.) It was perfect for them. My second through fourth graders saw our game and wanted to play too. I love it when that happens, easy planning for me, and engagement galore. 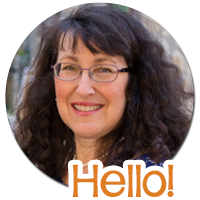 Eileen Christelow has written adorable books to illustrate the traditional rhymes and fingerplays, and added more adventures too! 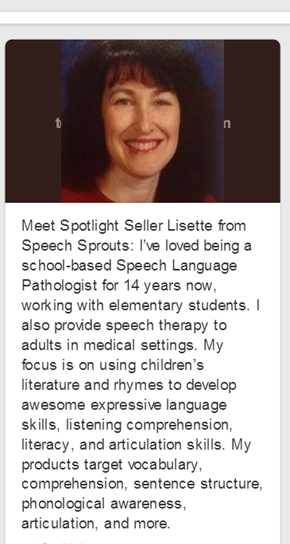 You could easily spend two weeks this unit, and there are plenty of speech and language goals to target. My favorite titles are Five Little Monkeys Jumping on the Bed and Five Little Monkeys Sitting in a Tree. 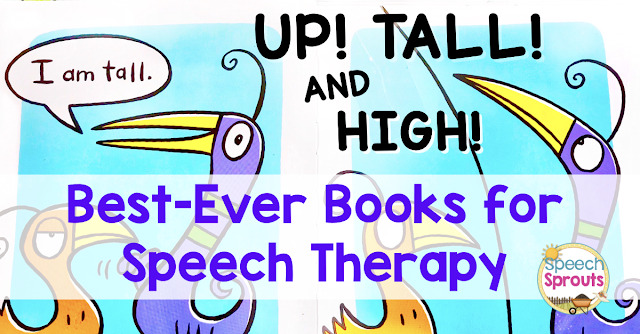 These books are perfect for speech therapy because they have repetitive text, simple storylines, and adorable illustrations the children love. 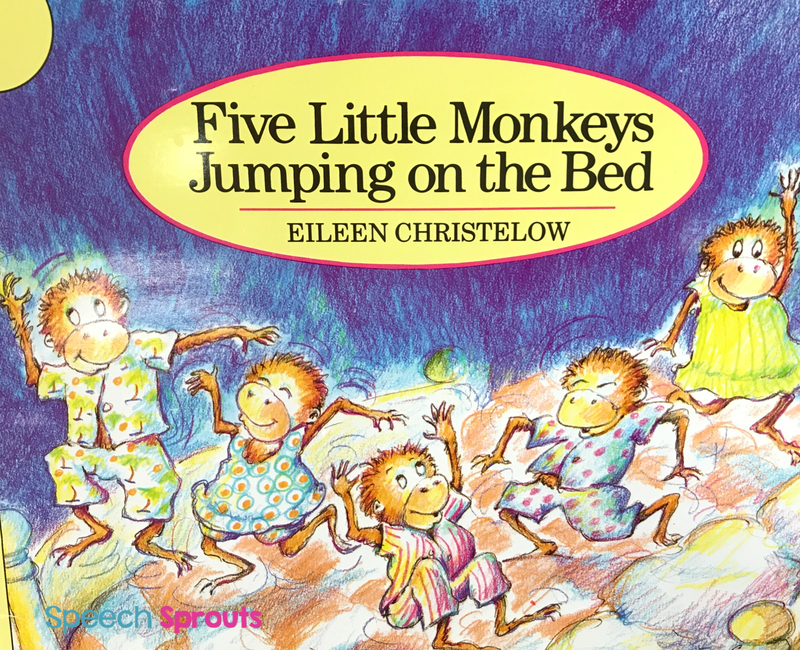 First, we read Five Little Monkeys Jumping on the Bed. The story starts out with the little monkeys getting ready for bed. They brush their teeth, Mama tucks them in and says goodnight. The little monkeys are supposed to be going to sleep, but as you probably have heard, these mischevious little monkeys start jumping on the bed as soon as Mama leaves the room. One by one the little monkeys fall off and bump their heads in this countdown song. Five little monkeys jumping on the bed. One fell off and bumped his head. Mama makes a call to the doctor each time who admonishes, "No more monkeys jumping on the bed!" My children just love that the monkeys are naughty. We use finger puppets for the monkeys. I also have a little "bed" for the monkeys. Truth...you may say stay away from the teacher giveaway table at school. ("You don't need more stuff!") But I scored this! Just saying. If you haven't acquired a little bed, you can easily make one for your monkeys. To make a simple bed, just put together a cardboard box, a small soft cushion, and a few dish towels. We take turns making the monkeys jump on our bed. They fall off and get a huge bump on their head of course. Ouch! 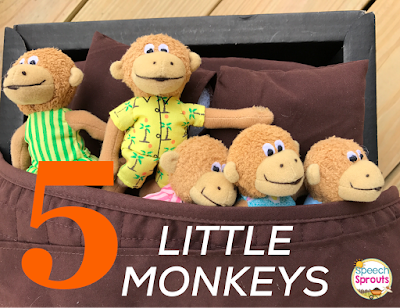 Goals you can target with Five Little Monkeys Jumping on the Bed. 1. Articulation: this rhyme is sound-loaded with initial /m/ (monkeys, Mama, more) and "J" (jumping) for articulation practice. 2. Position concepts on/off. How many monkeys are "on" the bed? Who is off? 3. Verb + ing: jumping. What is she doing? 7. Answering Where? Questions. Use finger puppets or printables to place monkeys in various places and positions. Ask "Where is the monkey?" After reading our story, we went to the table for some drill on our skills. We used our dot markers to complete this home-made motivational page. You do NOT need anything fancy to engage young children. They totally loved this activity that was hand-sketched from a picture we found. Maybe you're thinking you can't draw. (Neither can I, this was sketched by my talented assistant, Susan.) So if you prefer a ready-made activity, I went ahead and made one for you! He's fun to use with dot markers, crayons, bingo chips or even pompoms and over-sized tweezers to give him a fuzzy belly! Get this free download by clicking HERE. 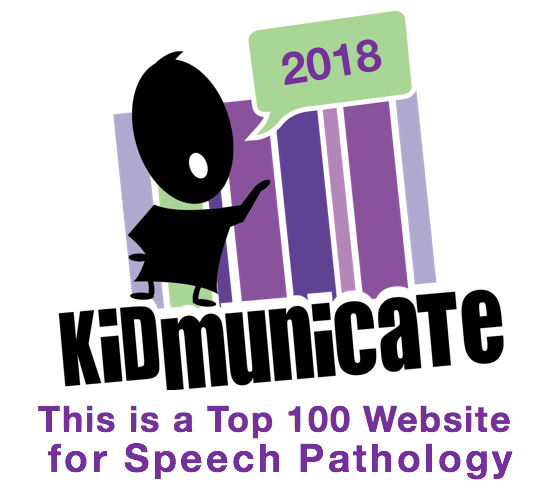 If you have read my blog post- Intensive Service Delivery Model for Preschool Speech Therapy, you know that I have two-hour sessions with my littles. We had several activities during our one long session, but you can absolutely target any theme across several shorter sessions. I love being able to review and ask the children to "re-tell" what we did the last session (or at the beginning of our long session.) Bonus: You get to read the story again. Repeated storybook readings are fabulous for reinforcing vocabulary, setting up children for success in answering questions and giving them plenty of opportunities for story re-tell. We couldn't neglect The Five Little Monkeys Swinging in a Tree. 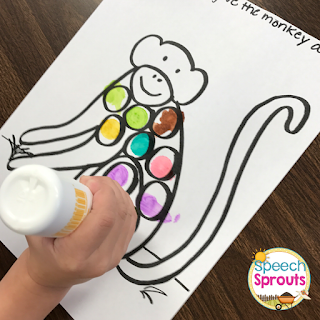 Check out my next post: Monkeyshines in the Speech Room: Adorable Five Little Monkeys Craft and Language Activities. If you have some great 5 Little Monkeys ideas, please comment and share. I would love to hear them!